On January 12th, a dozen-plus Winfield VFD members supported the day-long Klondike Derby held by the Carroll District of the Boy Scouts of America. The event was held at Krimgold Park and featured a wide-variety of outdoor activities. 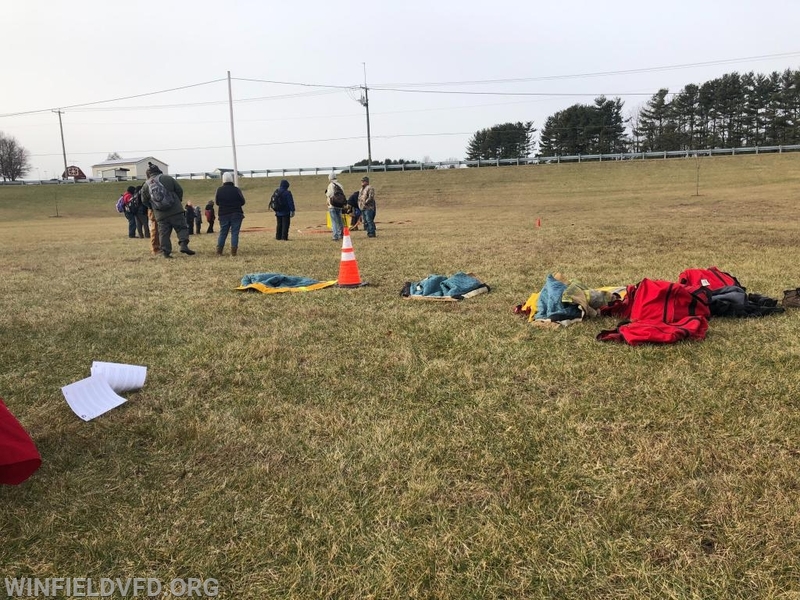 Over 900 Cub Scouts, Boy Scouts, and parents participated in the Klondike Derby and Winfield VFD members provided emergency response coverage as well as operated a "skill/challenge" station for Cub Scout dens. A month's worth of planning work was done in preparation for event day and Lieutenant Austin Johnstone served as the program manager for the event. He lead the charge along with a couple other officers working as assistants to develop an IAP (Incident Action Plan) using practices and skills learned in several recent ICS/NIMS training courses. 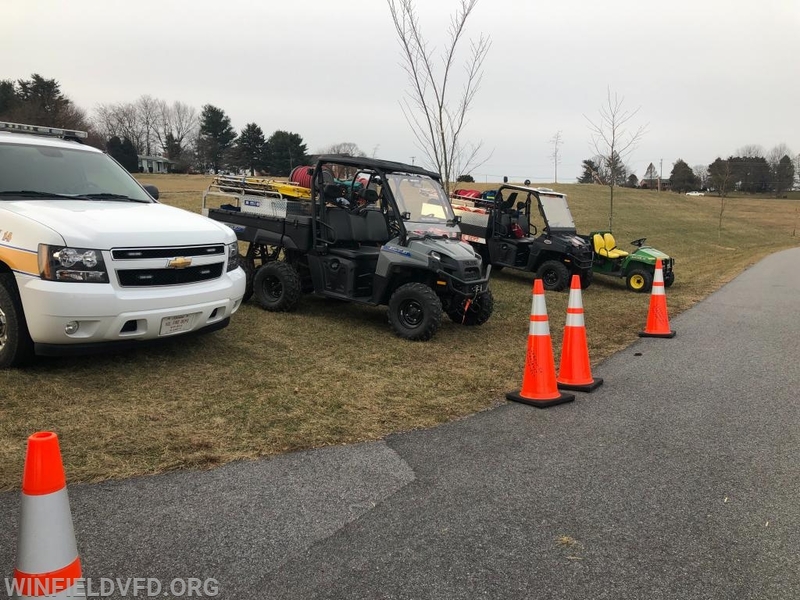 Carroll County Emergency Management provided use of their mobile command post and few neighboring fire departments provided use of their UTVs and support staff so that response crews could quickly access all areas of the large park. 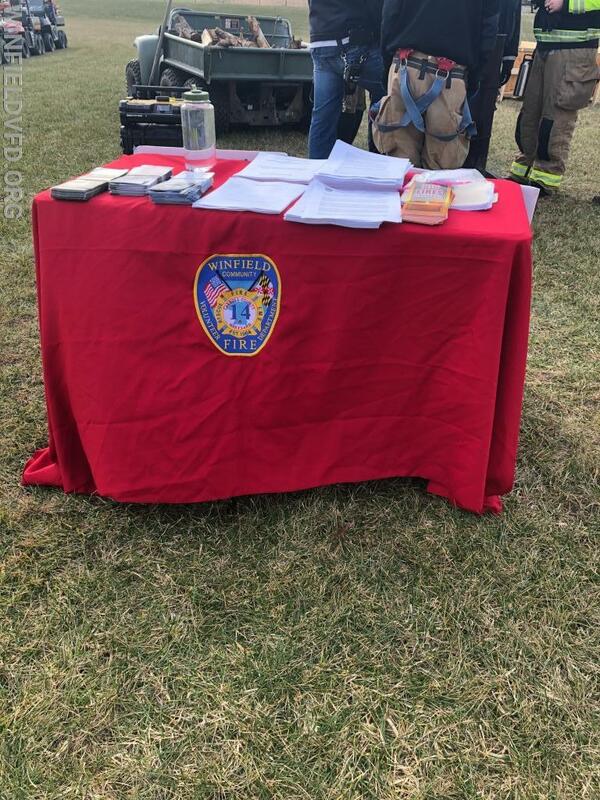 With over 900 folks moving about the park throughout the day...coupled with campfires and cold temperatures and physical skill challenge stations, crews had to be ready to provide assistance in a number of manners. Perhaps the most exciting part of the event was the FD skill challenge station run by several members of the Winfield VFD...including members of our Juniors organization. The skill challenge involved a turnout gear relay race, an entanglement hazard challenge tunnel, a hose line construction exercise, and a stokes basket carry evolution. The challenge station was available to all Cub Scout dens and almost every den completed the station. Finally, one of our public fire safety educators roamed the grounds providing opportunity for all Cub Scouts to earn additional scoring points (beads) by correctly answering fire prevention and life safety eduction questions. All of our social media accounts were used throughout the day to promote the Klondike event and our community outreach efforts. Many thanks to the Winfield VFD Ladies Auxiliary for providing meals to the members working the event. The weather held out and we had a grand time interacting with everyone in the community. We are already looking forward to next year's derby! A Cub Scout team works to load a simulated victim into a Stokes basket. The team must carry the basket 50-feet without dropping the basket or the victim. The turnout gear relay race. The entanglement tunnel. Teams must crawl through the tunnel that is filled with wires and cable obstacles which they must crawl under and through. The starting line of the turnout gear relay race. 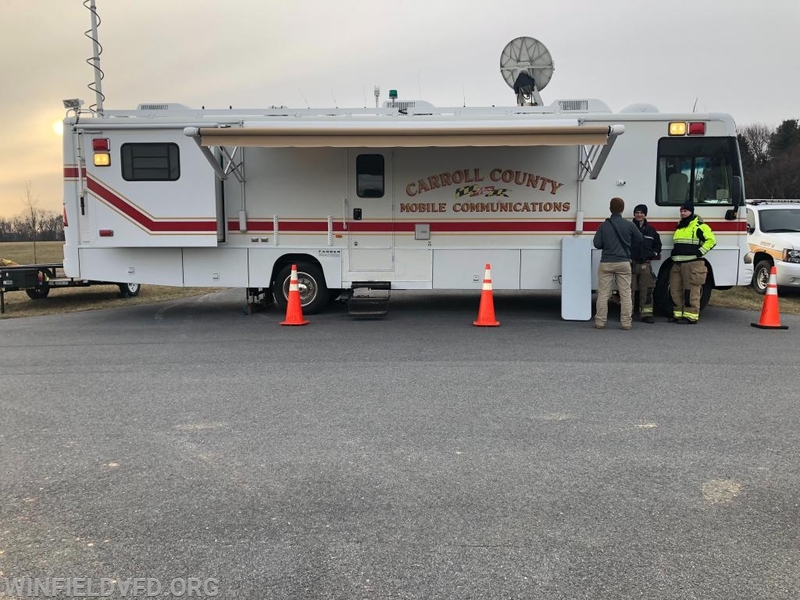 Carroll County Emergency Management's mobile command post was used throughout event day as a warm and secure facility to coordinate fire/rescue operations. 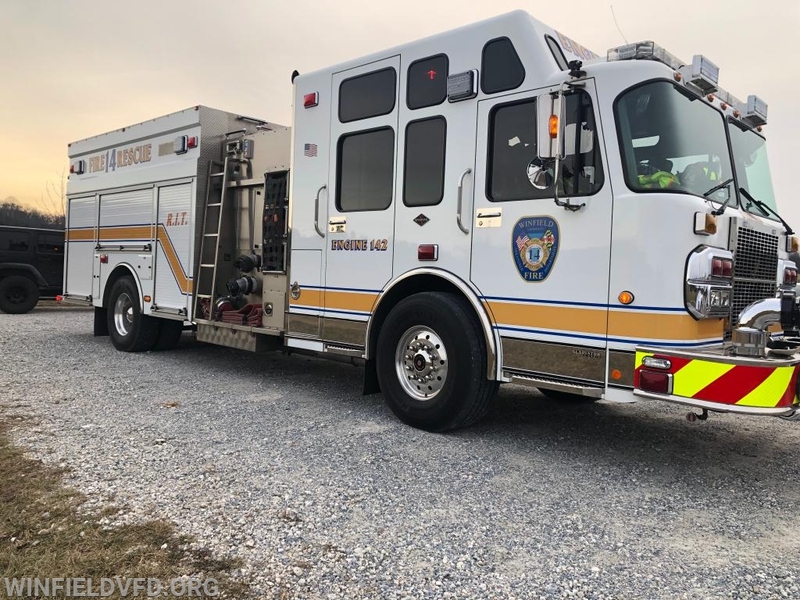 Engine 142 was staffed and remained available to response. The "build a hose line" evolution. Our fire prevention and life safety information table. Cub Scouts getting ready to start the challenge station.